Get ready for discussion, celebration, tasty traditional foods, and maybe even a little festive dancing at Saint Mary’s Cultural Nights, which explore the historical milestones, customs, and contemporary issues facing six historically underrepresented and marginalized groups. Through spoken word, theatrical pieces, music, food, dance, and other creative media, students express their individual and collective identities, and reflect on the issues of the day at these events hosted by the Intercultural Center. 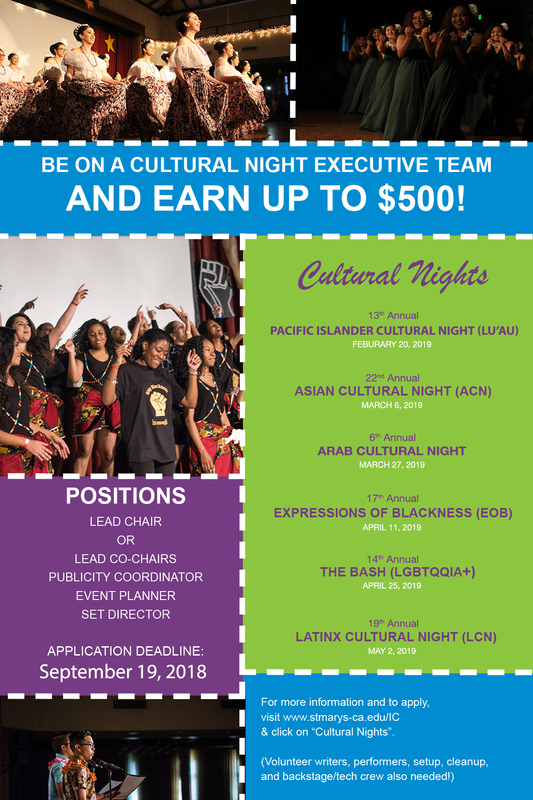 “Broadly, I think Cultural Nights are about celebration,” said Desirée Anderson, director of the Intercultural Center. “It is about mixing tradition and heritage with current issues and topics. It is an opportunity for students to share with their peers, faculty, staff, and family their connections to their heritage and the lived experiences that shape who they are today. It is a chance for the SMC community to understand and learn more about a variety of communities that perhaps they do not get as much exposure to in their daily lives. “I think most importantly, it is about building community and expanding existing friendships for those who spend hours and hours together bonding over the creation of the night,” Anderson added. “I’m super excited to be involved in cultural nights this year again,” said Leslie Montano ’16, MFA ’18, coordinator at the Intercultural Center and a Cultural Night advisor. “I've participated as a performer in all the cultural nights, I've been a part of the exec teams, I've been part of event staff, and now I get to advise one!” she said. The team focuses on eliminating Middle Eastern religious stereotypes: “Most people assume that all Arabs are religious Muslims, when the Arab world is a common place for Jews, Christians, and Muslims,” Nino said. Still to come in the Cultural Nights series are the 17th annual Expressions of Blackness, Thursday, April 11; the 14th annual The BASH (LGBTQQIA+) on Thursday, April 25; and the 19th annual Latinx Cultural Night on Thursday, May 2. Events already held include the 13th annual Pacific Islander Cultural Night and the 22nd annual Asian Cultural Night. All events begin at 5:30 at the Soda Center. Tickets are sold at the door. Students with ID: $4; SMC staff, faculty, administration, & alumni: $6; children 5 & under: free; everyone else: $8. Note: BASH prices will be $4 for all attendees. Cash or check only.